The 03101 is the three-cup anemometer included with our Wind Sentry Sets. You can purchase it separately if your application requires only wind speed measurements. The 03101 connects directly to a Campbell Scientific data logger, which measures the anemometer's pulse signal and converts the signal to engineering units (mph, m/s, knots). The 03101 uses a cup wheel assembly to measure wind speed. Rotation of the cup wheel produces an ac sine wave that is directly proportional to wind speed. The frequency of the ac signal is measured by a data logger pulse count channel, then converted to engineering units (mph, m/s, knots). Campbell Scientific’s version uses shielded bearings, which lowers the anemometer’s threshold. The 03101 anemometer is supplied with a galvanized 10-in.-long x ¾-in. IPS threaded pipe, which mounts to a crossarm via a CM220 mount or 1049 Nu-Rail fitting. The 03101 can also be mounted to the top of a CM106B or a stainless-steel tripod via the CM216. An ideal application for the Wind Sentry is wind profile studies. For this application, the LLAC4 4-channel Low Level AC Conversion Module can be used to increase the number of anemometers measured by one data logger. 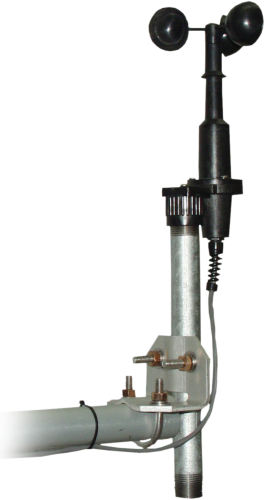 The LLAC4 allows data logger control ports to read the anemometer’s ac signals instead of using pulse channels. Data loggers compatible with the LLAC4 are the CR200(X)-series (ac signal ≤1 kHz only), CR800, CR850, CR1000, CR3000, and CR5000. The 03101 uses one pulse count channel on the data logger. The 03101 is read by the PulseCount Instruction in CRBasic and by Instruction 3 (Pulse Count) in Edlog. Wind speed measurements can be taken and processed with any of the data loggers. What might cause a 03101-L to produce a signal that is not high enough to be registered by the magnetic pickup? Very low voltage outputs from the sensor could be the result of a bad coil or an internal magnet that was mounted incorrectly. Refer to the “Troubleshooting” section of the instruction manual for more information. If it is necessary to return the sensor to Campbell Scientific for repair, request a returned material authorization (RMA) number by following the steps listed on our Repair and Calibration page. How is the 03101-L, with its offset fitting and strain relief, mounted to the conversion kit? Remove the screw that attaches the 03101-L to the pipe mount fitting. Set the screw aside, but do not discard it. Mount the plastic flange of the 03101-L sensor to the underside of the crossarm. Use the screw to secure the sensor to the crossarm. What calibration options are available for the 03101-L? For information, refer to the “Calibration” section at the end of the instruction manual. If a cup breaks off the 03101-L, can the cup be replaced, or is a new sensor needed? The cup assembly can be replaced with pn 4609, Replacement Wind Speed Cup Assembly for 03001 or 03101. Is the 03101-L capable of delivering a 0 to 5 Vdc square wave output for the wind speed? No. But using a LLAC4 will convert the ac signal for up to four 03101-L sensors (and other ac output anemometers) to individual 0 to 5 Vdc TTL level square wave outputs. For more information, see the LLAC4 specification information. How can the pulse output of a 03101-L be converted to a 4 to 20 mA output? The pulse output can’t be converted easily to a 4 to 20 mA output without additional equipment. For a wind monitor designed to generate a 4 to 20 mA output, refer to the R. M. Young website. How do the 014A-L 3-Cup Anemometer and 03101-L Wind Sentry Anemometer compare? Any mechanical wind speed sensor will need to have its bearings replaced on a regular basis. The 03101-L is a less expensive sensor and does not have a reed switch to replace. It’s easier to work on, and the bearings are less expensive. The turret covering the bearings is longer and protects the bearings better from dust and debris. The cups and sensor body are plastic and more fragile, so careful handling is required, but they hold up well after the sensor is installed. The 03101-L comes with a ¾ in. pipe. The 014A-L has a 1 in. pipe. Can the 03101-L be installed in a position that is tilted to the horizontal? No. Installing the anemometer in a tilted position will cause damage to the bearings and the shaft, and the bearings will be infiltrated with water and dust.